Popular for their low oiliness and juicy, thick flakes, rockcods are worth experimenting with for hearty menu items. They are especially good fried, barbecued or steamed as fillets or steaks. Grilled rockcod steaks are excellent served with pepperonata or tapenade. Try baked in a rich vegetable provenÁale, or salted, for a unique taste. A traditional Greek preparation is to flake poached finfish such as rockcod, mix in an egg batter, deep fry the fritters, and serve with skordalia and braised beets. Rockcods can also provide good flavouring for stocks and soups and are excellent in curries and casseroles. Heads of large individuals are sought after for the cheek flesh, which is used in soups and stocks. Live rockcods are popular in some Asian restaurants. They are also superb raw, particularly in a Tahitian salad. 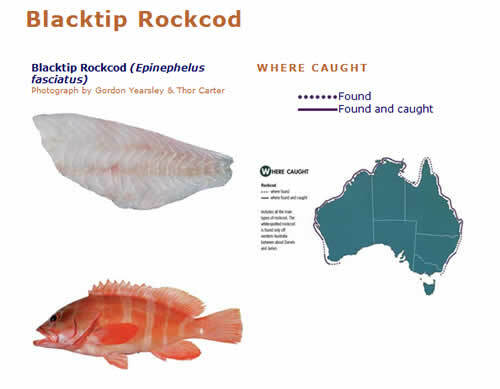 The flavour varies with size (smaller rockcod tend to have more flavour) and capture area (ocean-caught rockcod can have a cleaner taste than estuary-caught rockcod). Flesh Colour: White to dark, Saltwater rockcods have white flesh whereas the flesh of estuarine rockcods is darker. Bones:Some pin bones, but these are large and easily removed. Price: Rockcods are medium-priced finfish. Larger rockcods command higher prices. With food styles such as rockcod baked provenÁale, with the basic flavours of onion and tomato and the wild herb aromas of southern France, the compatible wine style needs to be dry and reasonably forceful, with blends of chardonnay, semillon or other wine varieties. The sizes of rockcods vary con-siderably. Several species are very large, with one reaching about three metres in total length and 400 kg in weight. Marketed individuals are usually 30 120 cm in length and 0.5 – 25 kg in weight. Despite its name, the blacktip rockcod (pictured above) sometimes has dark red tips on its dorsal fin rather than black.